Why Do You Need Alert Notifications? If you need to quickly and effectively communicate with your employees, are you able to do so? Sometimes situations arise where you may need to get a message to your staff urgently. This can include emergency situations such as terror attacks, active shooters, fires or natural disasters. Perhaps there is severe weather forecast. Maybe there is an internet outage that will stop staff from being able to perform their work. Or even an urgent cyber security threat such as a virus, hacking attempt or ransomware. The nature of emergency situations is that every second is valuable and it is essential you communicate with staff as swiftly as you can. Traditional internal communication methods don’t always cut it when you need to get your messages to your people quickly. Email is unreliable as more often than not email messages get lost in cluttered inboxes and don’t get opened. Your intranet site relies on staff looking at it. And making telephone calls to everyone in the company is time-consuming. An alert notification system, such as DeskAlerts, will allow you to send urgent information to your employees whenever there is a situation that warrants it. With DeskAlerts, at the touch of a button you can instantly communicate with your entire workforce, or just those employees in an area directly affected by an urgent situation. 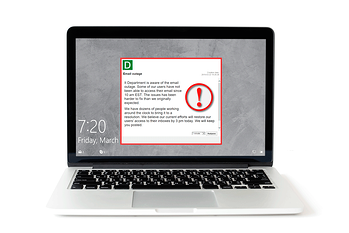 Messages are sent to employees’ PC screens and appear as a pop-up notification, alerting staff to the situation and giving them appropriate instructions in a matter of seconds. Messages will be received even if your staff have their computers locked, sleeping or on screensaver mode. DeskAlerts client CHU Saint-Pierre is a university hospital in Brussels, Belgium, utilized the software during when three coordinated suicide bombings took place in the city in March 2016, killing 35 people and injuring more than 300 others. The hospital used DeskAlerts as a messaging channel for management and hospital employees to handle the situation. “Shortly after the explosion, the hospital was in an alert state and the internal phone network became overloaded,” said Geoffrey Collet, the hospital’s Application Administrative. “When the external phone network went down, we used DeskAlerts to notify the employees about switching to SMS messaging. “After the bomb alerts occurred again, we used DeskAlerts to notify employees about police with sniffer dogs operating in our units,” he said. Henry Ford Community College in the USA needs to communicate with a large number of people quickly and found DeskAlerts was the perfect tool for the job. They had been using email and SMS messaging systems to notify students and employees, which became problematic in a class room environment where teachers and students often turned off their phones so as not to disrupt the class. Email recipients didn’t always have their email client open to see the messages. “Just like in many organizations, most people at the college are glued to a PC all day,” said Joe Zitnik from the college. “They may ignore phones ringing, and they may not choose to open their email for hours at a time – but a notification popping up in their desktop work space is IMPOSSIBLE TO IGNORE! We are completely happy with the product as it is,” he said.